You must reset the lamp timer after replacing the projector's lamp to clear the lamp replacement message and to keep track of lamp usage correctly. 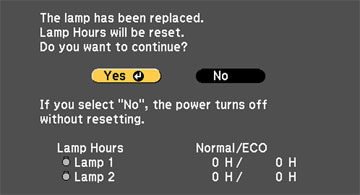 Note: Do not reset the lamp timer if you have not replaced a lamp to avoid inaccurate lamp usage information. Select Yes and press Enter. The count for the lamp you replaced will return to 0 hours. Published: Jul 14, 2014 Was this helpful​? Thank you for the feedback!